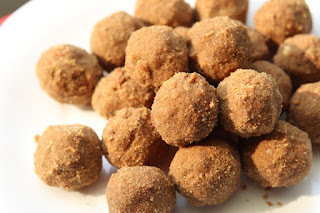 See how to make these Gond ke Laddu. These laddu are specially made during winter season as it gives heat and energy to body. Edible gum ladoo are healthy and delicious ladoo to eat during winters. 1. In a heavy bottom kadai, heat desi ghee and roast makhana for few minutes till crisp. Remove from kadai. 2. Heat 1-2 tbsp ghee, add gond and fry till it puffs up and becomes crisp. Remove from kadai. 3. Heat balance quantity of ghee in kadai, add whole wheat flour in batches and cook the mixture on high flame till flour becomes brown. Stir the mixture continuously for even browning. It will take 20-25 min depending upon the quantity. 4. Meanwhile, crush fried makhana and gond with crusher or back side of spatula. 4. Once brown, add coarsely grounded almonds in the cooked atta ghee mixture. Switch off the flame. Add crushed makhana, gond, grounded coconut. Allow the mixture to cool down a bit. 5. Add powdered sugar in the mixture and mix well. 6. Prepare gond ke laddu/ladoo and cool it down completely.